In today’s blog, I’d like to recognize the fact that the graphic novel form is not widely recognized among Christians, including pastors, ministry leaders and bookstore owners. In fact, I’ve found there’s a common stereotype among believers that a graphic novel is inherently immoral, theologically unsound, and undermines rather than uplifts God’s Word, Christ, and the gospel. It’s true that secular graphic novels frequently have themes and content that dishonor God. But there are exceptions to this. 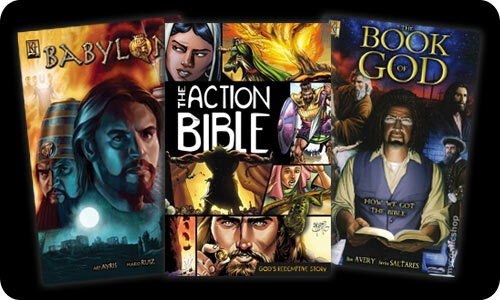 Kingstone Media is a Christian publisher, founded by a pastor, dedicated to producing quality graphic novels that are biblically sound and Christ-centered. (Check out their website to browse their books.) The popular Action Bible, which my grandsons love and has sold a half million copies, has also proven that this format can be both engaging and Christ-honoring at the same time. 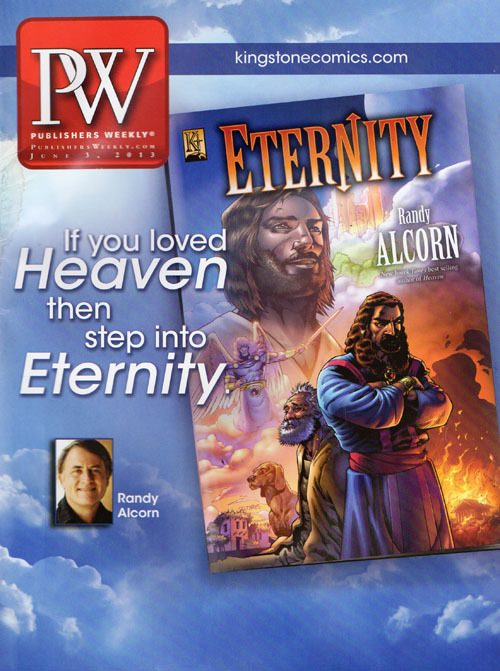 Eternity brings a familiar biblical story to light in an engaging and powerful way! I appreciate these endorsements showing Eternity to be a good family book, which is not something people often think of with graphic novels. Jesus spoke in the language of real people. His stories used everyday elements to convey eternal truth with a power that reached to the deepest emotions of the heart as well as the mind and spirit. Randy Alcorn does the same in this graphic portrayal of Jesus’ parable. Using pictures and words, symbol and narrative, he reaches to the core of people whom his other excellent books will not touch. Even we geeks will find this book exciting! As for the gospel-centered aspect of the book, and kids being eager to read it, let me tell you a story from this past weekend. I was playing tennis with a friend at public courts. Two kids were there, maybe 10 and 12. I gave them Eternity. I showed them the art, including Christ on the cross, and his resurrection. I told them the artist has done a lot of work with Marvel Comics. Their eyes were big, and they were delighted to receive it. They asked if I’d written other graphic novels, and I said, "No, but I'm writing another one, the story of the Apostle Paul." They looked at me blankly, so I asked if they had heard of the Apostle Paul. They shook their heads so I told them how he had hated Christ but came to be his follower. They kept flipping through Eternity and asking me questions. Then, there were two teenagers on the court next to us, one Hispanic, the other Asian. When they were leaving, I gave one of them the book, and he started reading it on the spot, and kept reading as he walked to his car. Then the two of them came all the way back to the courts and asked me if I would sign it for him. I did just what I’d done with the younger boys ninety minutes earlier. I showed them Christ’s crucifixion and resurrection, and talked about Jesus dying for our sins. I asked the other guy if he wanted a book too, and his eyes lit up as he said, "Sure!" Then, I asked these guys if either of them have a church they attend. They shook their heads. I asked my friend about a good church nearby, and he recommended one and said it had lots of kids their age. I encouraged the guys to attend. They seriously appeared very interested. My buddy pinpointed the church's location, and they said they might check it out. I encouraged them to send me an email after reading the book. I've given away a ton of books to countless people over the years, but I've never had one before that unbelieving young people get so animated about. As I write this, there's no doubt in my mind that two boys and two young men, in the last 48 hours, read cover to cover a book that clearly conveys the gospel of God's grace! These are kids who don't go to church and don't know who the Apostle Paul is, and likely have just heard the gospel for the first time ever! I can’t tell you how much joy that gives me! I’d encourage you to pick up a copy of Eternity or one of Kingstone’s other graphic novels and read it yourself. If you’ve never read a comic or graphic novel, I predict you’ll be pleasantly surprised at how much you like it—and find it Christ-honoring. And I hope it will give you a vision for all the young people in your life you want to reach with the gospel. P.S. You may be interested in other endorsements of Eternity, including from Max Lucado, Jerry Jenkins, and Frank Peretti. I’m excited to share about a new graphic novel version of the Bible that’s now available, called The Kingstone Bible. It’s released by my friends at Kingstone Media, a publisher dedicated to producing quality graphic novels that are biblically sound and Christ-centered. In superheroes we see a secondary and dim reflection of Jesus, who is the Primary, the Light of the world.